Hank W.: How do you like my Merc hat? Al H.: Advance mobile oil service. "we change the diff oil while you drive"
OneHotLap: Will do a free 20-point check too while you're driving! Yani A.: Another wreck, brought to you by Corvette's fantastic brakes! 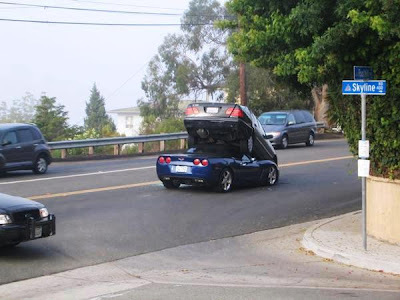 Jamey F.: Vette: "I swear officer, I was driving down the street minding my own business when this Mercedes just dropped out of the tree on me!" Jamey F.: Mercedes: "I am the tree stalker! Rawr!" Jamey F.: Note this happened off "Skyline"... I smell a Nissan plot to take over the world! OneHotLap: Fastest way to get a cab-forward design? Get humped by a Benz! Jamey F.: Mercedes don't care, he'll eat BMWs, he'll eat Audis, eww look he's eating a Vette! OneHotLap: It's possible but I doubt it. Lots of broken glass on the pavement (driver side) and the front of the 'Vette is pushed pretty far down judging by the lack of gap between the front passenger tire and the fender.